Enjoy a Yurt Holiday nestled in the majestic Sierra Nevada mountains. Do you dream of finding the perfect vacation rental, where you can relax and centre yourself – where you can just be, without doing too much? Somewhere that’s near enough to culture and civilisation to ensure delightful days out, yet far enough away to offer you peace and quiet? Somewhere that has good facilities (like a swimming pool), yet is built on sound eco-friendly principles? 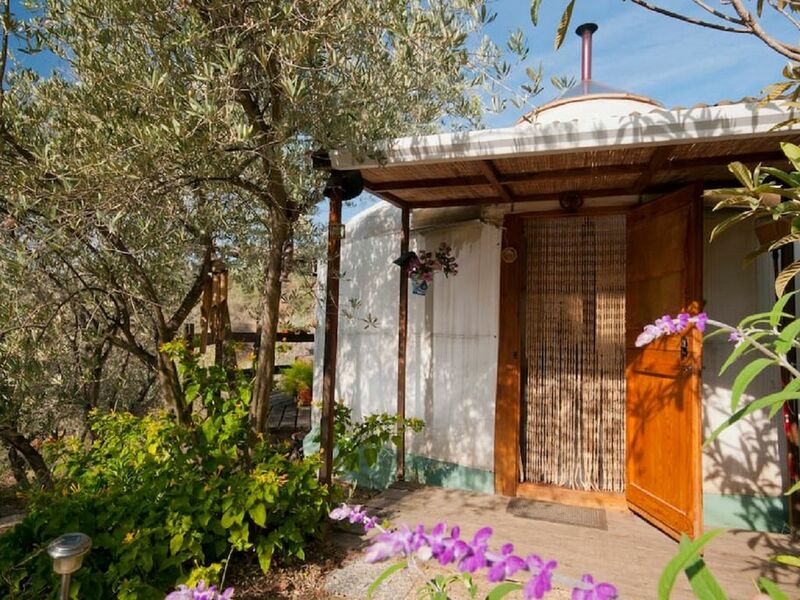 Then this enchanting Yurt, in Armonia Alpujarra, could well be the perfect place for you. Nestled amongst almond and olive groves, this Yurt has a 7m diametre round structure, beautiful wooden floors and canvas walls. The Yurt is eco-friendly and self-contained - being partly-furnished and equipped with all modern facilities. There are 2 double beds and a dining area, with plenty of space to relax and lounge. There is an external eco-friendly shower and compost toilet. Yurts enjoy a different energy from more conventional living spaces, due to their rounded shape and pointed top, which creates a sense of spaciousness and tranquillity. Guests can gaze up at the stars at night and enjoy the natural light during the day. The Yurt enjoys a beautiful terrace that is classic for evening meals is situated on the southern part of the yurt, with easy access from the kitchen/living room. Guests can also have use of the luxurious outdoor swimming pool or just laze in a hammock, in the beautiful surrounding garden areas. Armonia Alpujarra is self-sufficient, eco-friendly and being in the heart of nature, it enjoys a peaceful, harmonious and healing environment. There are many activities and excursions also available to enjoy at Armonia Alpujarra and in it's surrounding area. It's a truly special place and it’s only 5 minutes drive from the famous Spa town of Lanjaron and, the City of Granada is approximately 45 mins drive away! The nearest beaches on the Costa Tropical are Playa Granada near Salobrena and at Torrenueva just east of Motril. Journey time about 45 mins. Also, in the winter months, the ski resort 'Sierra Nevada' is worth a visit and is situated 1.5 hour drive away. In addition, to accommodation, at an extra cost, you can book additional services such as Yoga classes, Meditation and a variety of healing treatments (Reflexology, Massage, Shiatsu and Acupuncture) and we can organise great vegetarian food. The Yurt is a comfortable 2 hour drive from Malaga airport and 1 hour drive from Granada airport. There are many good and very reasonably priced car hire firms from the airport. People talk a lot about the secret of manifesting abundance, for Yair & Ziza, the owners of Armonia Alpujarra, their story represents just that. It began in California (1992), where they both studied different forms of alternative healing & complementary medicine. Although, both from Israel, they didn’t know each other, but they’d both been attracted to the same place at the same time. Following their studies together they each searched new ways of expressing their healing abilities. They wanted to be able to help people to de-stress, understand the causes of their pain, put that pain behind them, help them to get in touch with their true selves to emerge feeling happier and more whole. Ziza developed her own style of Foot Reading. Yair created a diagnosis method based on reading people’s Auras and Chakras. Both unique systems support clients on their journey towards healing and well-being. Since realising their vision 'Creating a Healing Retreat Centre in Spain', which includes their rental properties, they have over 20 years experience, and their work continues to evolve. Yair & Ziza feel truly blessed to have found Armonia Alpujarra, a magical place that supports in nurturing mind, body & soul and, where they can bring people together to help them along their own journey of inner personal growth. Yair and Ziza both are dedicated to the healing arts, and a wellness life style. They both enjoy dancing, working on their land and spending time with people - their guests. Yoga and meditation is important part of their life and they particularly emphasize that they enjoy 'laughing and enjoying this magical opportunity called 'life'!. The location is amazing, as well as being in beautiful nature - peaceful, harmonious and healing - the property is only 5 mins from the famous Spa town of Lanjaron, only 45 mins from the wonderful City of Granada and the same distance, just 45 mins, from the local beaches. Armonia Alpujarra is truly a special place, providing the ideal opportunity to unwind and relax being close to, and within, beautiful wild nature! Armonia Alpujarra is a truly special place - peaceful, harmonious and healing. You cannot fail to go back home feeling calm and totally rejuvenated! The Shower is external from the Yurt and just few steps below. There is hot running water to enjoy. The toilet is also external and it is a compost eco-friendly type. The Yurt is located in Armonia Alpujarra, which is set in the foothills of the majestic Sierra Nevada Mountains, enjoying spectacular views in every direction! We provide local and fresh Spring Water from Lanjaron. For an extra payment. Not available all year round. Available, on request, for an additional fee. Our House Rules: Our Electricity is supplied by solar panels, therefore: - Please DO NOT use a hair dryer. - The electric sockets can only be used for lighting and to charge mobile phones or computers. - Please ensure that you switch off any lights, when not in use, and conserve energy. Please shut the main door, of your accommodation, is at all times. Please do not feed the cats or allow them inside your accommodation. Smoking is prohibited inside of your accommodation. You can smoke outside and we request that you place filters in the jars supplied. Outdoor furniture is available for your use - we, therefore, request that you do not remove any furniture from the inside of your accommodation. Our outdoor swimming pool is covered. Please ensure that you close the cover after using the pool. No outside shoes allowed in our accommodations Please follow our specific instructions given in the property for rubbish disposal Thank you! Enjoy your stay! We went for a weekend stay. We found the best thing was the pool, nice, clean & warm (although the area around the cover internally was not clean) and the views. The Yurt was not very clean, was lacking in cooking utensils and the things that were there were old and not very desirable. If the owner spent a little money these are things that would make a difference. There was also a mountain of things stored under the beds and lots of junk around which collected dust and invited insects (which in a rural location is not good). The sheets on one of the beds also smelt like they had not been washed. The owner was not very pleasant or helpful either and then said on the last morning " I forgot to say can you leave at 11" we did not see this in the terms and conditions. We are sorry that you have found a few things which you didn't like during your stay but we are grateful that you sharing it with us. We will do our best to correct and improve according to your comments for the enjoyment of future guests. We originally wanted to stay in one of the yurts but both were unavailable . Instead we were offered the casa iris, a cute and cosy little cottage, which was perfect for us. It had everything we needed including wifi! In the evenings we were able to swim in the pool and sit on the terrace watching the sun go down. Bliss. Yair offers shiatsu massage along with a range of other therapies. We had the shiatsu which was relaxing, invigorating and emotionally cathartic. We didn't want to cook so we had the delicious food which was tasty, fresh and wholesome. Overall our experience was wonderful and if you are looking for peace and quiet but with access to the villages of lanjaron and orgiva, with Granada and the coast a longer drive away, then this place is ideal. Yair is a thoughtful and considerate host who, along with his wife, has created an oasis of calm with all mod cons. Highly recommended. Peace and love! Many thanks for your beautiful review. We are so happy you had a nice experience and we are looking forward to have you back. One of our best and most unusual holidays we ever had. Even with our one year old son it was very relaxing, energetic and joyful. We definitely will come back to that special place! Dear Bettina, Thanks for your review. It was such a pleasure to host you and we re looking forward to see you again. The famous and local Spa town of Lanjaron is 5 minutes drive away and a 30 min walk. Here, you will find everything you need, such as banks, supermarkets, restaurants, bars, quaint tourist shops (selling typical regional items) and a pharmacy/chemist. The main square is located towards the exit of the town, direction to Granada. In the square, you will find a great Ice Cream shop, Pizzeria and a delightful Pancake place. Órgiva, approximately 15 mins drive away, is the central town of the Alpujarras and is famous for its double towered church as well as its multi-national residents. Here you find lots of great places to eat, with fabulous international cuisine with quirky touches. There are quite a few quirky cafe bars, panaderias (cake/bread shops), Tobacconists (sell stamps) and a Post Office. Órgiva Market: Every Thursday, located at the top of town just past the town hall, ends at 2 pm. Specialises in big underwear, terrible Spanish music and bead jewellery. There can be some lovely one off stalls. A great place for people watching! The bustling City of Granada is a fabulous place to explore and only 45 minutes drive by car. The City enjoys a cathedral, the Albaicin, Sacromonte gipsy quarters and, of course, the Alhambra Palace - book at least 2 days ahead, as tickets sell out quickly. Also in Granada, is the Aljibe Hammam (Arabic Spa Baths): a gorgeous place to spend a few hours relaxing, bathing and enjoying a massage. Remember to take a swimming costume. In the surrounding areas there are many Mountain Villages - drive towards Órgiva and turn left just after the big BP garage, following signs to Trevelez. Three villages worth visiting at the top of the Poqueira Valley are: Pampaneira, Bubion and Capileira. They’re all very pretty with good cafes, bars and shops.